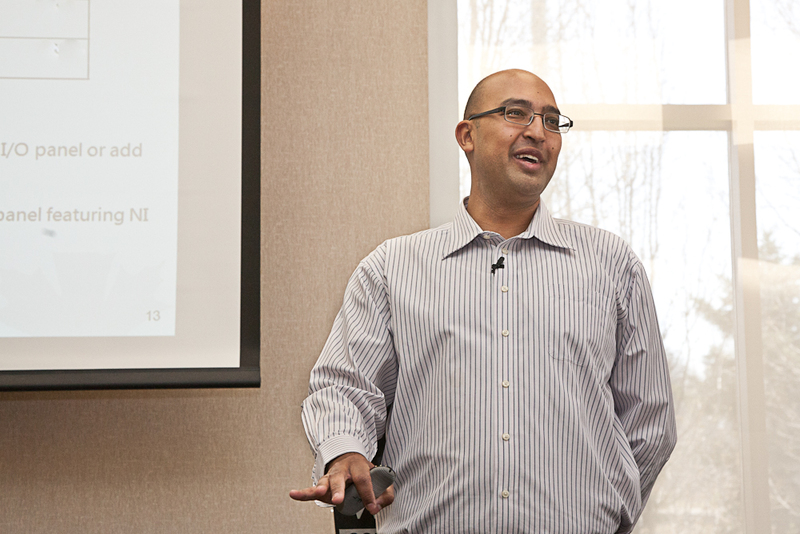 Abdullah Dhooma spends his working day speaking two languages: engineering and marketing. As Quanser’s new Product Marketing Engineer, his specialized “language” skills are employed to co-ordinate communication across different departments and working groups inside and outside the company. He is closely involved with Quanser products at every stage of the development, sales and marketing cycles. Abdullah also acts as a bridge between Quanser and National Instruments as the two companies grow their partnership and offer new instructional and research solutions to academic engineering labs. Abdullah Dhooma, Quanser's new Product Marketing Engineer, makes a presentation introducing the our newest product, the fully integrated QUBE-Servo Rotary Servo Experiment, during the recent Quanser Distributor Conference. Abdullah completed a Bachelor’s degree in Electrical and Computer Engineering and an MBA at Ryerson University. He is a licensed Professional Engineer in Canada, and has also earned Project Management Professional (PMP) certification. Abdullah joins Quanser with 10 years of experience as a product and business manager at a company responsible for building part of the Canadian weather station of the Phoenix Mars Lander. A tinkerer by nature, Abdullah was a computer enthusiast and Internet user at a very early age. So his path to becoming an engineer was a logical one. As he puts it, “It’s who I am. I love the problem-solving aspect of engineering.” When he’s not helping to guide the development and marketing of Quanser’s engineering education solutions, he spends his time with his family as well as reading and playing golf.